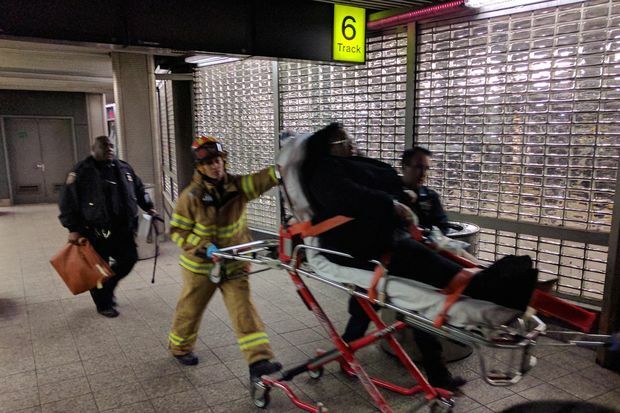 Emergency responders transport an injured woman from Atlantic Terminal Wednesday. BROOKLYN — A Long Island Rail Road train crashed into a wall in the Atlantic Terminal during the Wednesday morning rush hour, injuring 104 people, officials said. The commuter train was under conductor control when it failed to stop and slammed into the safety stop, called the "bumping block," before tearing through an office wall at 8:20 a.m. One of the tracks then pierced the bottom of the lead car, according to the FDNY and transit officials. The train was carrying more than 600 passengers. None of the injuries were considered life threatening, FDNY Assistant Chief Dan Donoghue said. "It could've been quite a bit worse, without a doubt," he said. Passenger Daniel Alvarez, 49, was riding in the back of the train, which transit officials said left Far Rockaway at 7:18 a.m., when it crashed on Track 6. "The train was approaching the platform doing what it does," he said. "All of a sudden, it just stopped. Everyone just went flying on top of each other." Rider Wendy Gerzog, 57 said passengers began screaming and that her car became smoky. "We fell down on the floor. There were piles of people," she said. "We couldn't get out the front door because the train was so raised up from the platform." Rescuers found that the injuries were minor, but the number of casualties presented a brief challenge to helping commuters. "When we got there, there were a lot of people that needed help so we basically, with EMS and NYPD and FDNY, we triaged," Donoghue said. "We get the people out of the train that can move, those that couldn’t move we assisted. We sat people down on the platform and we waited for more help to come in"
"A rail actually pierced the bottom of the train," he added. "It’s actually fortunate we didn’t have more severe injuries." "The question is why didn't the train operator stop before the bumping block," Gov. Andrew Cuomo said. Investigators will work to determine how fast it was traveling when it entered the station. MTA Chairman Thomas Prendergast said the train travels less than 10-15 mph as it enters the terminal and is manually controlled at the point where it crashed. "There's a signal system that controls it coming in, but when you get to the end, it's the locomotive engineer's responsibility," Prendergast said. Anticipate possible delays into and out of Atlantic Terminal this morning due to an incident at the terminal. 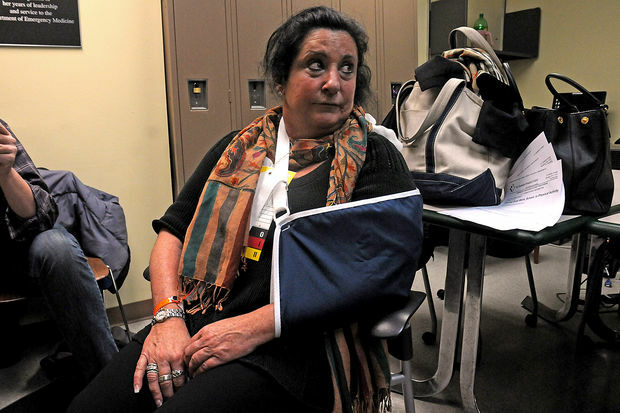 Rider Wendy Gerzog injured her arm in the crash. Trains were expected to run as normal for the evening commute, Cuomo said.